We woke up Tuesday still tired. This was really wearing on our fifty-something bodies. My wife had already taken a tumble (outside of Hammersmith Station and in full view of four Bobbies who came rushing to her aid and made me feel rather inadequate), all of our old ballet stress fractures were aching, and it wasn’t until about 6AM that my muscles relaxed. I didn’t understand it, I mean, we weren’t walking a lot on a mileage basis—perhaps 3 or 4 miles each day?—but as my wife pointed out, add that up and we were now coming up on 50 miles of walking. Having researched a bit about the Civil War, it gave me a new appreciation for the feats of the average Union Soldier, who regularly put in 10-mile days. So, our Tuesday plan was simple: a visit to Leighton House, and a walk through Holland Park. Experience sent us to the internet before leaving, though, and we quickly learned that Leighton House wasn’t open on Tuesdays. How’d we miss that? No matter. No crying. Plan A was dead and buried. Move on to Plan B. This is the sort of gritty, nimble, stick-to-it-ive-ness that separates the experienced traveler from the wide-eyed newbie. And so we pressed onward. Our backup plan was a trip to Westminster Abbey. We’d been to the Abbey before, but we just didn’t spend enough time there (it was somewhat less than 4 hours), so a return trip would be fun. We could tie it in with a trip to the Southwark Book Market, a great book market that is held every day under the Waterloo Bridge along the Southwark Walk on the south bank of the Thames. Sounds good, no? Traveling to Westminster Abbey we took our standard bus/tube/tube combo. Allow me, if you will, a moment of reflection upon the art (yes, art) of driving a bus in Britain. In the old days of the Routemaster double-decker bus, we did not see what can only be called a magnificent community-choreographed ballet. The reason for this was the simple fact that the Routemaster was narrower than the current models employed in London, and that private cars in London were both less prevalent and narrower, as well. That is, there used to be more room on the road in years gone by. Thus, what we have now is a solid wall of hefty cars parked on both sides of the average residential street, and coming down the middle of it, a bus that takes up more than half of the remaining width. The result of this is a communal art form, an improvisational dance performed by car, bus, and lorry in which the bus leaps down the empty street until, in the distance, the driver spots an oncoming vehicle and must decide, “Do I have the nearest pull-out, or does he?” All oncoming vehicles must make the same decision, and together it becomes a wonderful, peaceful, graceful dance of slow-speed curves and pauses and blinking headlights as 100% of traffic moves through a space of only 90% the adequate width. This, of course, breaks down totally when the buses hit the central core, when the amount of traffic increases to 150-175% of possible throughput. That’s why, if you’re going anywhere near the core, the Tube is a better bet. Emerging from the tube at Westminster Station can be a gobsmack for the first-time visitor. 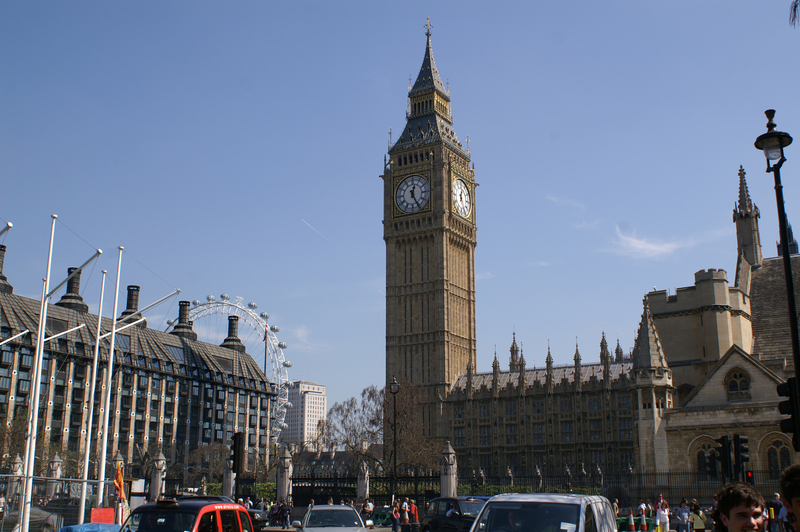 You walk down the tiled tunnel, following the signs directing you to the proper exit for the Houses of Parliament, and, as you emerge from the dark shadows into the British sunshine, you get the feeling of a large bulk behind you. 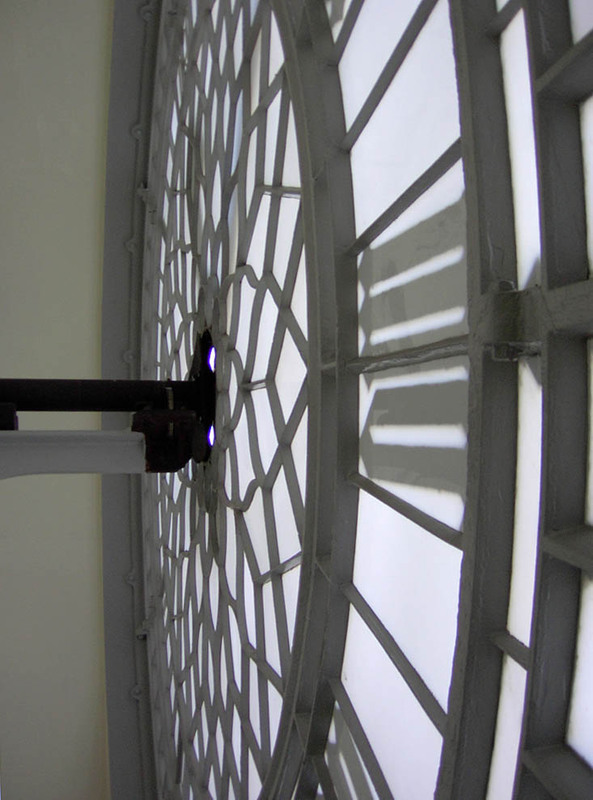 You turn, and there, larger than you ever expected, is the clock tower at the north end of Westminster Palace. 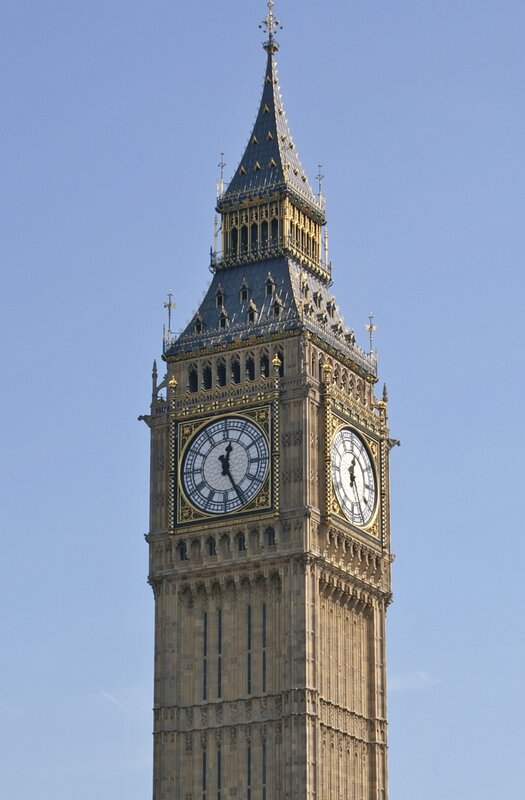 If you’re lucky, while you’re standing there gaping, the bells will chime, and Big Ben will toll the hour. 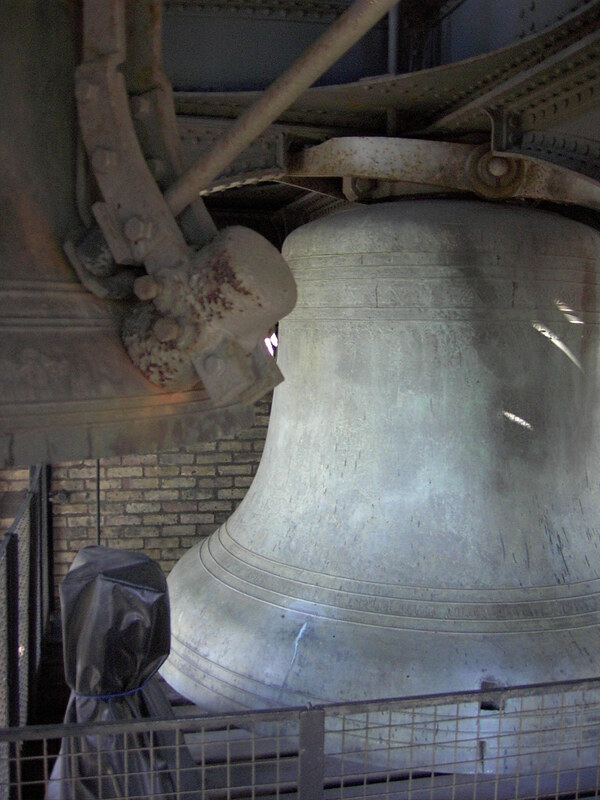 On one of our earlier trips, we actually climbed the stairs up the inside of the Clock Tower, and stood in the belfry as that bad boy tolled noon. One word: damn. Anyway, when we emerged into the British sunshine, what we first saw was nothing short of The Rest of Europe. We had not realized that Holy Week (Easter Week) is a much bigger deal in Europe than it is in the States. This year it was an especially big deal because, in addition to the regular “bank holidays” of Good Friday and Easter Monday, the Brits also had the following Royal Wedding Friday off to see Wills and Kate get hitched. The kids across Europe have Easter Week off from school, and many British families took the next week off, also. Add to this the fact that the weather fulfilled its threat to become even more summery, and the result was smash-packed sidewalks and shoulder-to-shoulder tourists. Easter is a big holiday here, and not just because the Brits have yet to scrub all vestiges of religion from their society. Easter is still a religious holiday, of course. Where we have Easter bunnies with eggs and spiral-cut ham, they have adverts for hot-cross buns and leg of lamb filling the space between shows on TV. But it’s also a family holiday. They don’t have Thanksgiving, of course, nor the 4th of July—two traditionally family-oriented holidays in the States—so Easter, with its week off from school for the kids, is the counterbalance to Christmas on the family holiday calendar. This year, with the holiday and the good weather, all of Britain, most of France, and a good portion of Germany, Japan, and parts of China were all crammed onto the sidewalks that lined the baking pan that was Parliament Square. 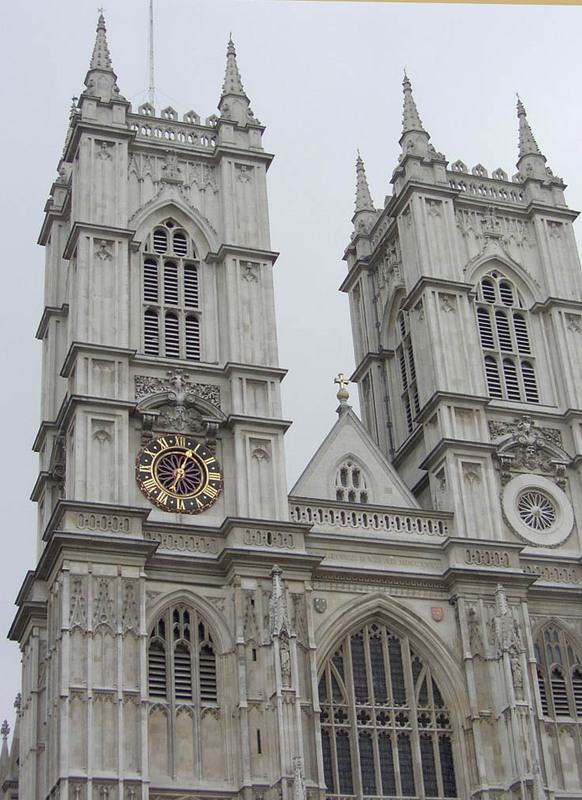 We pushed through the poached press toward Westminster Abbey and when we got there, we saw two hour-long lines snaking entirely around the abbey, plus a sign for the £16/person entry fee. If we’d never seen the abbey before, or if the lines were shorter, or if the price was less, we might have considered it, but with all the discomfort lined up in a row like that, we said no, turned back the way we came, and headed back over the bridge. Walk across the broad length of Westminster Bridge and turn left at the far end, and you’ll be walking the Southwark (pronounced “suth-uck”) path that runs all the way up to Tower Bridge. The London Eye(sore) is here, the modern Ferris wheel that, without air-conditioning, is more like a 90-minute ride on a hot-dog carousel at Yankee Stadium. The crowd was thick here, too, but as we pressed onward, we finally got room to breathe, and then room to walk freely. We passed under the Jubilee Bridge and then finally hit the shade beneath the Waterloo Bridge. The Southwark Book Market has appeared in several films (last we saw it was in “Last Chance Harvey”) and it used to be a good place for cheap books and Britain-only printings. This time, though, it was lackluster. The books weren’t exciting us, the vendors were hammering away, erecting tables and stands which, with the echoes under the concrete bulk of the bridge, was painful. We grabbed a drink to rehydrate and decided that downtown was not for us, not today, not for the rest of the week. We headed home, crossing the Jubilee Bridge and grabbing the tube at the Embankment Station. On the way, we came up with Plan C.
Plan C involved a #70 bus that we usually only took when we wanted to go up to Sainsbury’s. 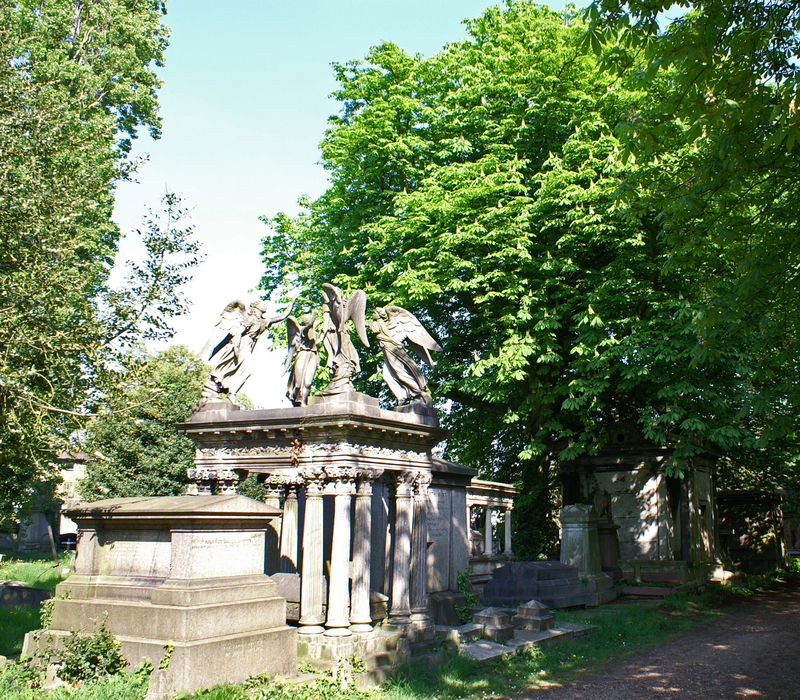 This time, though, I led us up, around the corner, over the canal (very pretty), and down the road a bit to the main entrance to Kensal Green Cemetery. 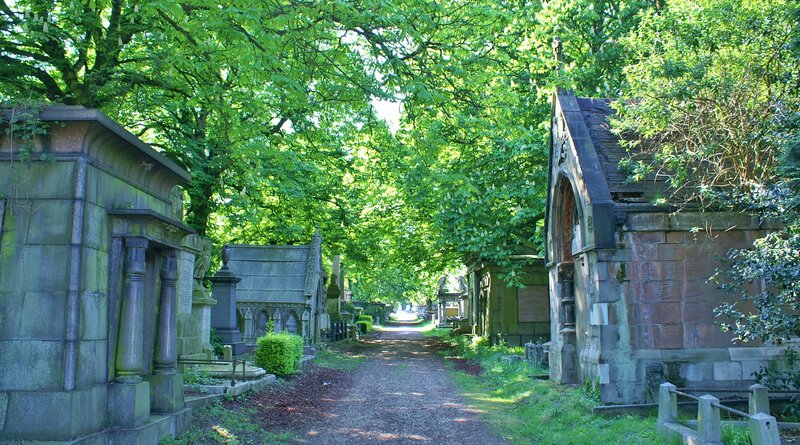 Kensal Green Cemetery is the final resting place for some famous folks—William Makepeace Thackeray, Steve Peregrine Took (yes, you read that correctly), Charles Arbuthnot, Princess Sophie—but that’s really not why I wanted to go there. I wanted just to be in a quiet place (cemeteries are good for that) and to see some of the memorials the Victorians erected to honor their loved ones. We often think of marriage in the Regency and Victorian periods—at least among those with money—as more like business transactions, but looking at the achingly sentimental memorials installed here, one realizes that the love match was not a rare thing. We walked the paths, and hid under the broad, upreaching branches of century-old chestnut trees. 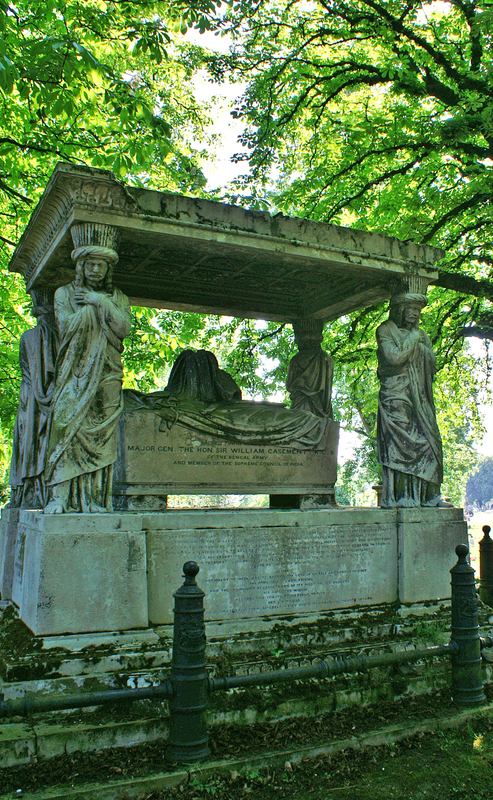 The place was run-down, and much less densely packed than Pere Lachaise was—at Pere Lachaise there wasn’t room for grass to grow between the stones, but here, we heard teams of strimmers working in the distance, mowing the grass around the irregularly shaped graves—but it was very peaceful and restful. The Victorian Gothic headstones stood both in juxtaposition and in partnership with the iron-girders of the tall, empty, cylindrical gasometers nearby, as items of the same era, but opposite ends of the decorative spectrum. To put a line under the experience, as we walked through the chestnuts, some of the wild parakeets of North London flew in and set up a chatter. About 50 years ago, some Indian Ring-necked Parakeets got loose from the zoo, and set up shop on their own. They’ve been in North London ever since, and provide a flash of the exotic in this urban landscape. Home, that evening, I researched a trip to Stourhead (one of the finest and largest manor houses and grounds in Britain), but that proved to be one of the places that Britain only wants you to go if you have a car. I looked up the Dorset regional bus schedule and found that the one bus (one bus only) that goes out anywhere near Stourhead (it only gets within 3 miles) only goes out that way on Thursdays (yes, one day per week), only goes once on Thursdays, and does not come back. I don’t know where it goes, but it doesn’t ever come back by that stop, not on Thursdays, not on any other day, so that pretty much put the kibosh on the whole Stourhead idea. Instead, we decided to use our two remaining travel days to go to places we’d seen before, but not spent enough time in: Bath and the Salisbury Plain.